After more than a decade of isolating itself from the international community, Eritrea finds itself tentatively stepping back into it. This week, the UN unanimously voted to lift sanctions against the Horn of Africa nation, which have been in place since 2009, following months of praise for the recent peace deal signed with neighbouring Ethiopia and improved relations with Somalia. In the space of a few months, Eritrea has transformed from a country with no allies into a key economic partner in the Horn of Africa. It has now succeeded in having the sanctions against it lifted and established a tentative position as part of the international community. However, most of the difficult questions surrounding Eritrea remain unanswered. While the recent transformation of the country’s foreign policy shouldn’t be undervalued, it will all be undermined unless the regime addresses its domestic issues. The peace deal signed by Eritrea and Ethiopia in July was unprecedented. A border conflict between the two nations, which had dragged on for two decades, remained a constant threat to security in the Horn of Africa. Eritrea’s position on the conflict was pretty simple: Ethiopia violated a border ruling that placed key territory within Eritrea and this was all Eritrean President Isaias Afwerki felt he needed to vindicate his country’s position. As far as Eritrea was concerned, it was Ethiopia’s responsibility to make the first move. Perhaps Ethiopia’s new prime minister Abiy Ahmed agreed with this sentiment because shortly after coming into power in April, a peace agreement was signed and Ethiopia committed to handing over the disputed territory to Eritrea. Ethiopia made the first move and, true to his word, Isaias Afwerki greeted the gesture with cooperation towards securing a meaningful peace deal. This was the catalyst for the transformation we’ve seen in the Horn of Africa over the past few months. With Eritrea and Ethiopia reconciling their differences, Isaias Afwerki was able to improve fractured relations with Somalia and now it has two regional partners in its ongoing dispute with Djibouti. Beyond the Horn of Africa, Eritrea is now healing wounds with its neighbours and becoming a new potential partner for economic opportunities and peace efforts in the region. In 2009, the UN placed sanctions against Eritrea over allegations the country was supporting militant group al-Shabaab, which continues to terrorise Somalia. These sanctions were strengthened when Eritrea refused to resolve its border dispute with Djibouti. However, Eritrea and Somalia have all but resolved their differences and Eritrea has at least attempted to do the same with Djibouti, leaving the UN with little choice but to lift the sanctions against Eritrea. 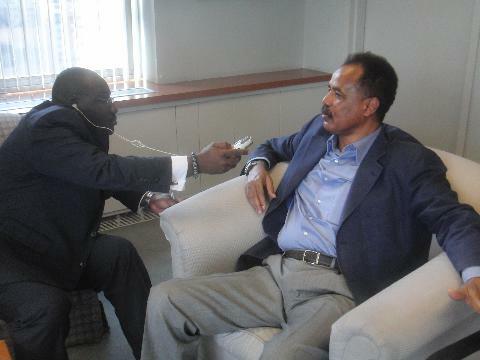 Isaias Afwerki has stepped out of the shadows. After being labelled as “Africa’s North Korea” for so many years by Western media groups, Eritrea is ready for a new moniker. The Horn of Africa nation is now partnering up with members of the international community, rather than isolating itself from all of them – even if these partnerships are limited to its regional neighbours for now. The problem is, Eritrea’s human rights record is fitting with a leader described as a despot by tabloids. However, Isaias Afwerki is only going to be able to achieve so much at the international level before addressing key issues such as the forced conscription, religious persecution and masses of refugees fleeing his regime. Scrutiny over these issues is already high but the questions are only going to intensify as Eritrea steps further into the international community – not only for Isais Afwerki, but also the leaders and economic partners who deal with him. The Eritrean government’s usual response is to refute accusations of human rights violations and distance itself from Western powers but this isn’t going to work now. Eritrea is going to be under the spotlight more than ever and, once the excitement over recent foreign political achievements settles, domestic issues are going to be questioned more intensely than ever.